I'm a sculptor and prop maker from Montreal and I love nothing more than making cool Halloween costumes! When this year my 5 year old daughter told me she wanted to be a robot (a long lasting obsession of hers) I was not going to disappoint her! A brief search on the internet quickly informed me that most parents idea of a robot costume is a square box wrapped in tin foil, so I decided to create something that was as far away as possible from that. I gave myself some inspirational direction: nothing could be cooler than a mix of "Aliens" power-loader mixed up with a Miyazaki styled robot, right? 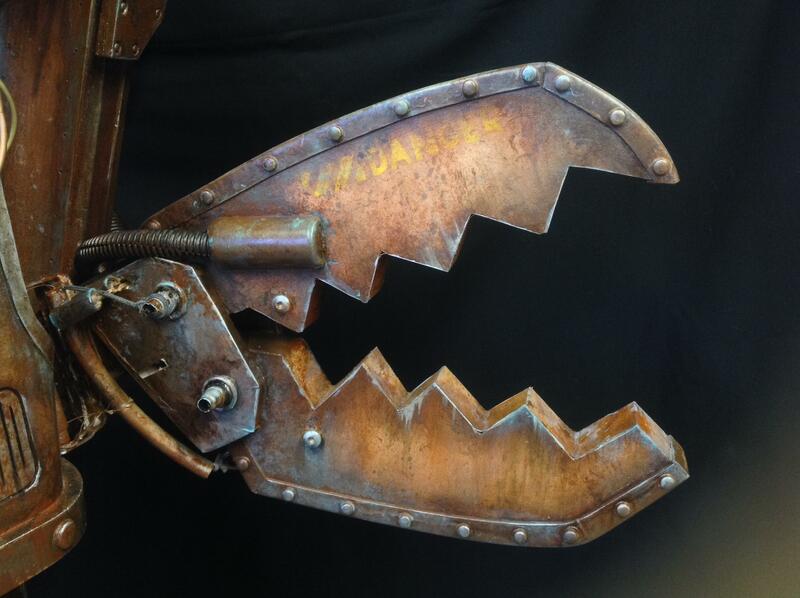 I wanted the giant arm and claw to be puppeteered by my daughter and made sure she could open and close the claw with a trigger. After making a mannequin from an outline of her in 1.5 inch isolation foam to build the costume over, the challenge was to make things as lightweight as possible (the whole costume weights only several pounds), and also enable a warm getup underneath as in Montreal, Halloween can be quite cold! The arms are made of pink isolation foam, wrapped in Corroplast and a very thin plastic sheeting on top to look smooth and give it some resistance. The hand is made of eva foam, as is the torso. The foam is glued on top of a front and back shape of Corroplast to minimize flexibility and help it keep it's shape. Both arms have a free joint at the shoulder and both elbows bend naturally. The boots and kneepads are all eva foam. 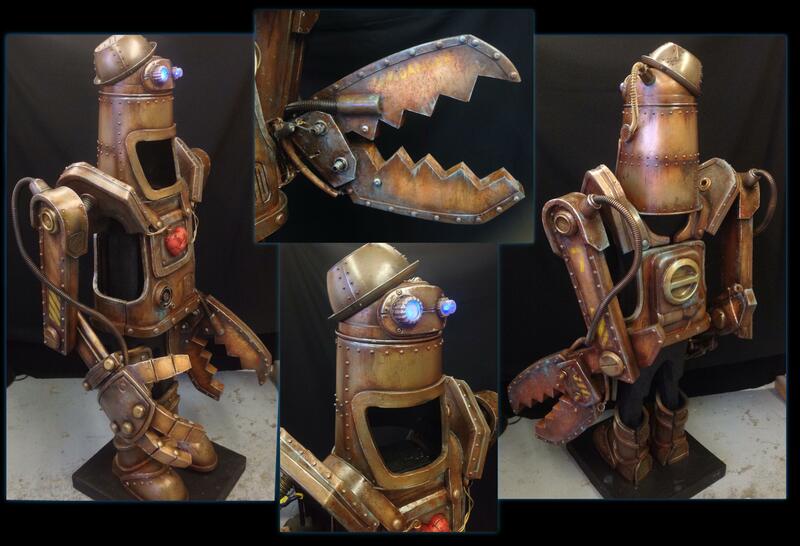 It was the first time I worked with eva foam and it was a blast! A robot wouldn't be complete without some lighting, so I used blue Leds for the eyes and 2 red flashing leds inside the heart to simulate the beating. The heart was sculpted and then vacuformed to be opaque once painted, but still transparent enough to let light from the leds bleed out. All the detailing is part craft foam, various bits and parts, about 300 different sized googly eyes (5 sizes in all) for the rivets and the whole thing was sealed and weathered to look old and rusty with acrylics over a battered metal rustoleum base. And that's it! Happy Halloween! This is incredible work! Do you have a page to follow? Beautiful work! Love the detailed paint job. Indeed! You have one lucky daughter. She has the coolest dad around. 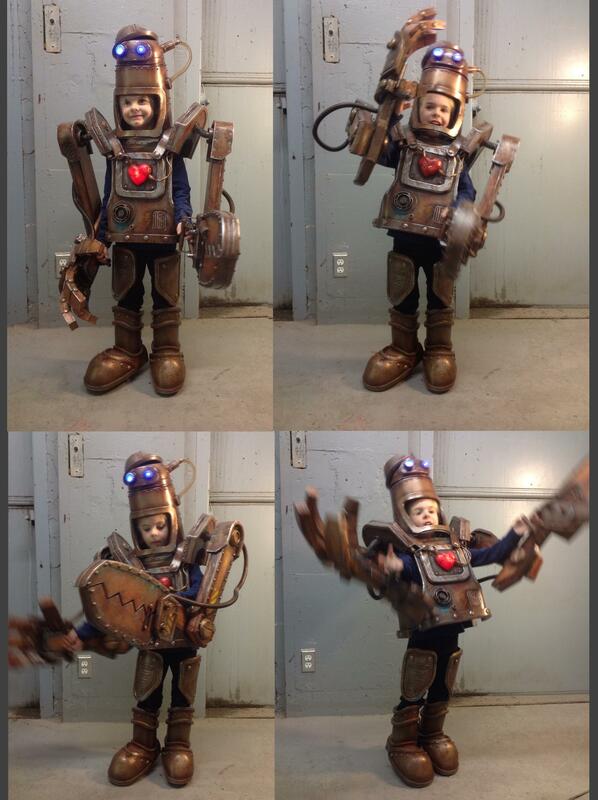 I'm a new aunt, and when my nephew is 6-7, he will have the coolest costume around! Thank you Chris and Jo Coring for your encouraging words! OMG finally got a chance to breath an come check out the costume, an this is beyond cute, ( costume is not to bad either! ) haha! Its a beautiful paint job,, an just love the way it looks all around,, totally awesome!!! Wendy, thank you so much; it was a labor of love! And yes it's pretty darn cute, even more so in action! Here's a small video where you can see the robot walking around a bit. Enjoy! This is amazing @Laurent Canniccioni very original, love the paintjob!